Creation Station Blog Tour – Spring has Sprung! Welcome Spring! And welcome to our Spring has Sprung edition of the Creation Station Blog Tour! 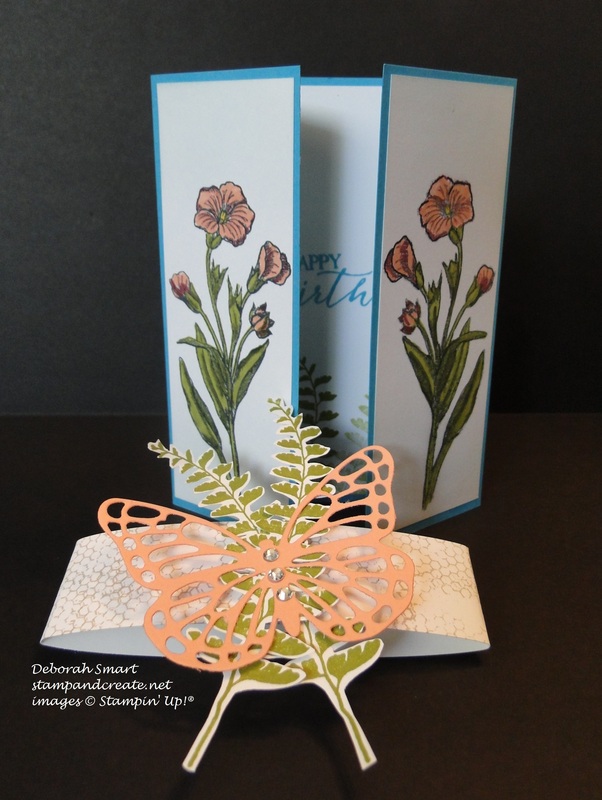 For this tour we will be featuring a Spring theme (in case you didn’t already get that), the stamp set Butterfly Basics, and the Berry Basket Die. So much fun to be had with these products! Now, I know that a lot of people have been frustrated because the Butterfly Basics Bundle (stamp set & framelits dies) have been unavailable due to the dock-workers strike, but the good news is that Stampin’ Up! is expecting a shipment by mid-April, so you will be able to order them, once again! Can I get a HURRAY!! It’s unfortunate that this situation happened, but believe me, we’ve all been as frustrated as you; it’s never fun when the situation is entirely out of your control. A quick reminder of how the Tour works; all of our blogs are linked in a circle, so no matter where you start, keep clicking in the same direction and you’ll make your way through all of them. Trust me – you don’t want to skip any, because you’re in for a treat with the amazing projects everyone has come up with, just for you! 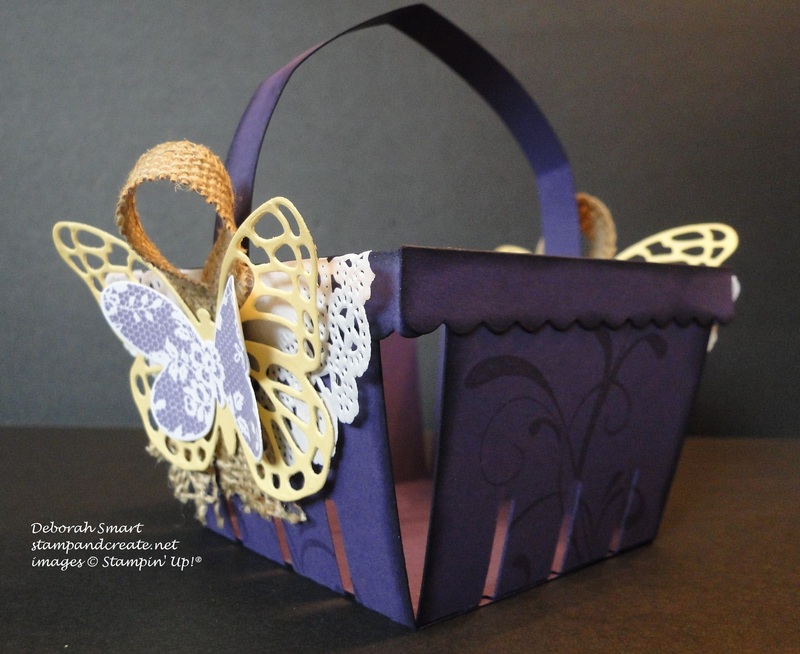 I created my basket using Perfect Plum cardstock – love that colour! Before assembling it, I stamped the main pieces with the flourish stamp from the Everything Eleanor stamp set, in Perfect Plum ink, as I just wanted a tone-on-tone look. I then sponged all of the pieces around the edges using a Sponge Dauber and the Perfect Plum ink, to give it a bit of depth. This side view gives you a better view of the stamping & sponging. The basket is super-simple to put together; I wanted to make sure mine would stand up to being filled with goodies, so I attached the base pieces together with Sticky Strip, and used Tombow Multipurpose Glue to attach the rim to the basket. I also used Sticky Strip to attach the handle. To decorate my basket, I cut one Doily in half, and glued it on to opposite ends of the basket. Then I cut a strip of Burlap Ribbon in half lengthwise, looped it, and attached it on top of the Doily with a Glue Dot. 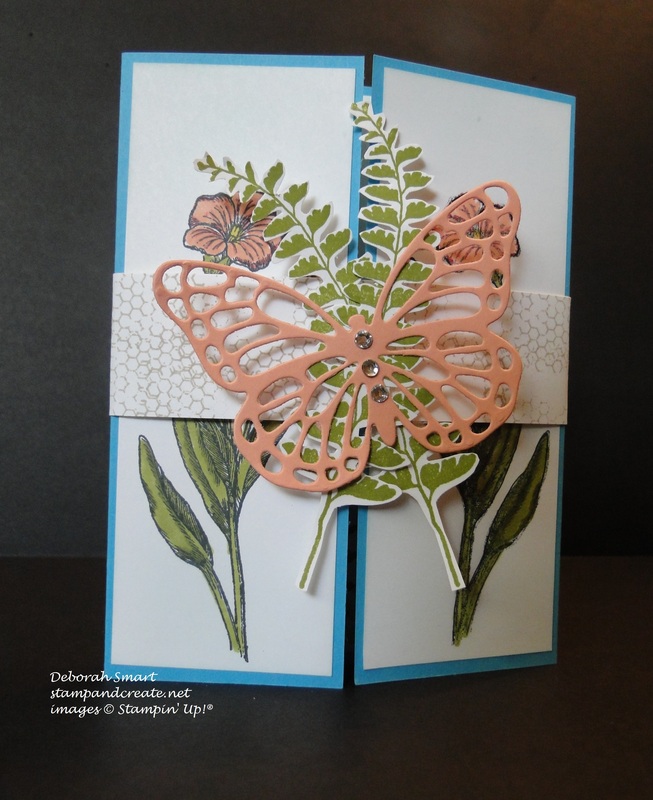 The large butterfly is made with So Saffron cardstock, cut using the Big Shot and the 2nd largest die in the Butterfly Thinlits die set. (demo tip – when creating my Big Shot ‘sandwich’ with these intricate dies, I always place wax paper on top of my cardstock, then place the die on top. This allows easy release of all the little detail pieces. I also run it through the Big Shot twice, to ensure it cuts all the way through). 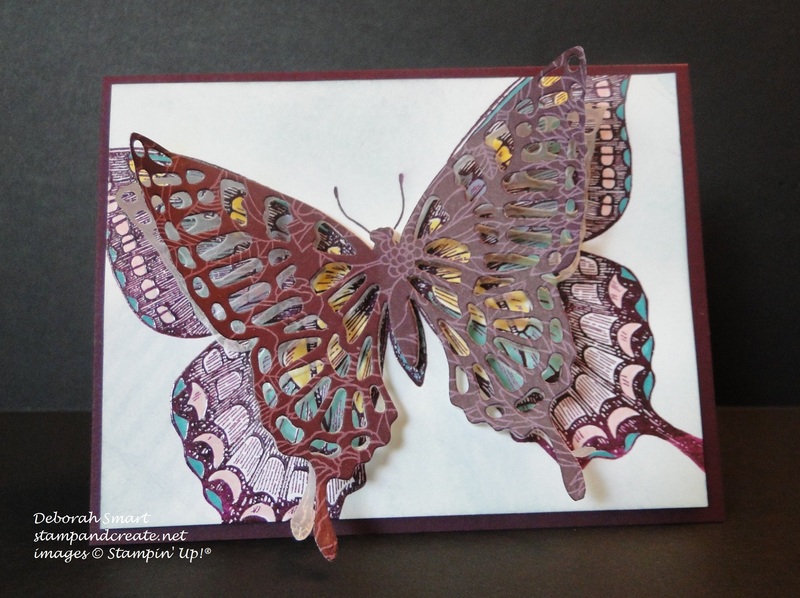 I then used the Butterfly Basics stamp set and stamped the medium butterfly in Perfect Plum ink onto Whisper White cardstock, and used the Butterfly Thinlits again to cut it out. 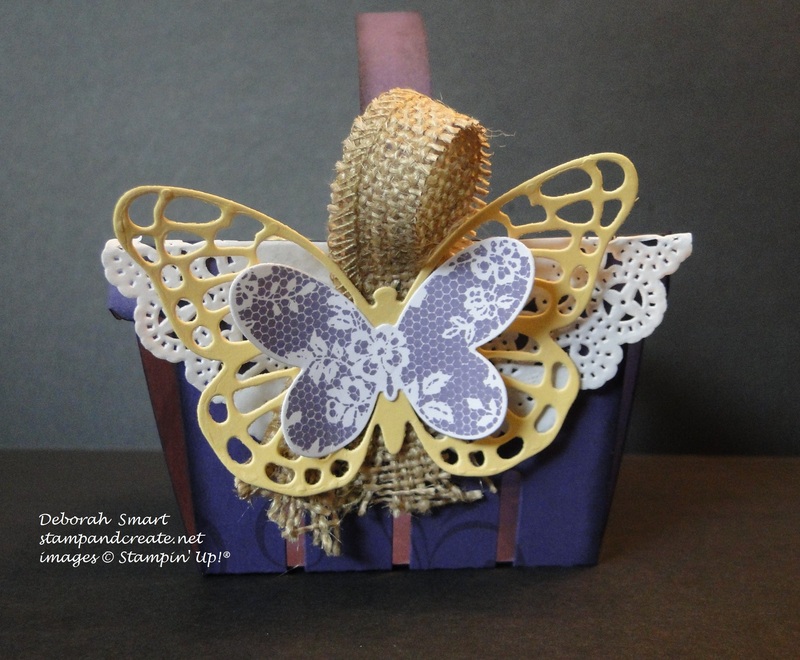 I layered the butterflies using Glue Dots, and for attaching them to the Burlap Ribbon. Do you remember the background stamp ‘Swallowtail‘? It was a must-have stamp for me; I love these butterflies, and growing up back east I used to see them all the time. So, combining the Swallowtail background stamp with the Butterfly Thinlits Dies seemed like an obvious thing for me to try! For some reason my camera doesn’t like Blackberry Bliss (actually, I think it was just too bright in the room) – but that’s the colour of the card base. I stamped the Swallowtail image onto a panel of Whisper White cardstock in Memento Tuxedo Black ink, then used my Stampin’ Write Markers to colour it. I used Lost Lagoon, Coastal Cabana, Daffodil Delight and Blushing Bride. I then used the largest Butterfly Framelit die and the Big Shot to cut the butterfly out of Park Lane Designer Series Paper – again, Blackberry Bliss is the base colour; this one has a subtle flower outline pattern on it. You can see from this side view that after removing the wax paper from the thinlit die, I then layered the wax paper cut-out between the stamped image and the die-cut butterfly. I makes me think of the butterfly rising off the paper, and preparing to fly away. I didn’t add a sentiment to the front of the card; I felt that adding one would make it too ‘busy’, and take away from the butterfly image. 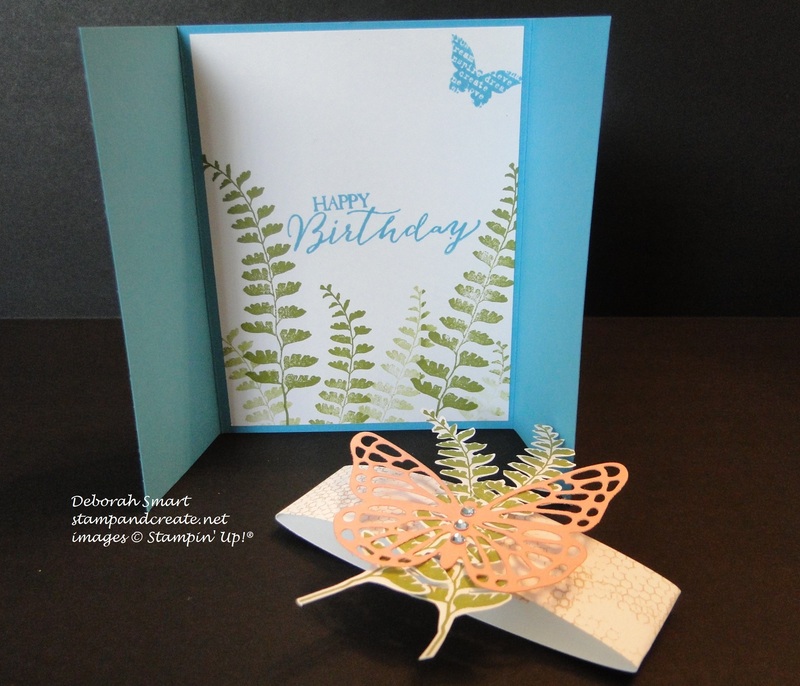 My final project is another card; this time using different elements of the Butterfly Basic stamp set. This is a shutter card, made by starting with a Tempting Turquoise card base of 5 1/2″ x 8 1/2″, and scoring at 2 1/8″ and 6 3/8″. I created 2 panels of Whisper White cardstock for the front panels; I stamped the flower image on the left side in Memento Tuxedo Black ink. I wanted my flowers on the right side to be a mirror image of those on the left, so I inked up the stamp again with the Memento black, then stamped onto a piece of Window Sheet (acetate). I then quickly flipped it over, and rubbed the image onto the 2nd panel of white. Presto – mirror image! I used my Stampin Write Markers to colour the flowers; using Crisp Cantaloupe overall, and adding Strawberry Slush for depth. The flower centers were coloured with Daffodil Delight marker; for the leaves I used the darkest and lightest of the Old Olive Blendabilities Markers (I know, they’ve been discontinued, but since I still have them, I’ll use them up until they’re dry). The belly band is a strip of Whisper White cardstock stamped in Crumb Cake ink with the ‘honeycomb’ image stamp. I stamped 2 of the ferns onto Whisper White cardstock, and yes – I fussy cut them with my Paper Snips! (it wasn’t as difficult as I anticipated!) I then die cut the medium Butterfly Thinlit Die out of Crisp Cantaloupe cardstock, and layered everything together in the center of the belly band, adding Rhinestones to the butterfly. In this photo, you can see that the band simply slips off of the card, and the two ‘shutters’ open left and right. Here you can see the card fully open. I stamped the fern image several times in Old Olive ink, stamping off without reinking for different depths, and stamping the sentiment using Tempting Turquoise ink. That’s it for my projects – I hope you enjoyed seeing them, and have gotten some inspiration for using your own Berry Basket Die and Butterfly Basics set & Thinlits. I’d appreciate it if you have time to leave a comment – I always appreciate them! 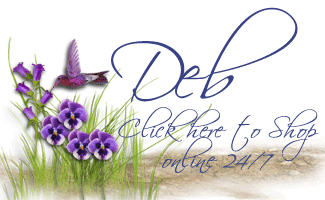 So now you’re ready to head over to see what magic Kathy has performed for your enjoyment – simply click on the ‘Next’ button for her blog, or the ‘Back’ button to re-visit Jennifer’s projects. Previous Previous post: Winner, winner, chicken dinner! Next Next post: Free Shipping Starts Today! What a great idea to layer the large Butterfly Thinlit over the Swallowtail stamp! Your butterflies are wonderful. I love the textures on the berry basket and your shutter card is one I’m going to be CASE-ing! Simply fabulous! 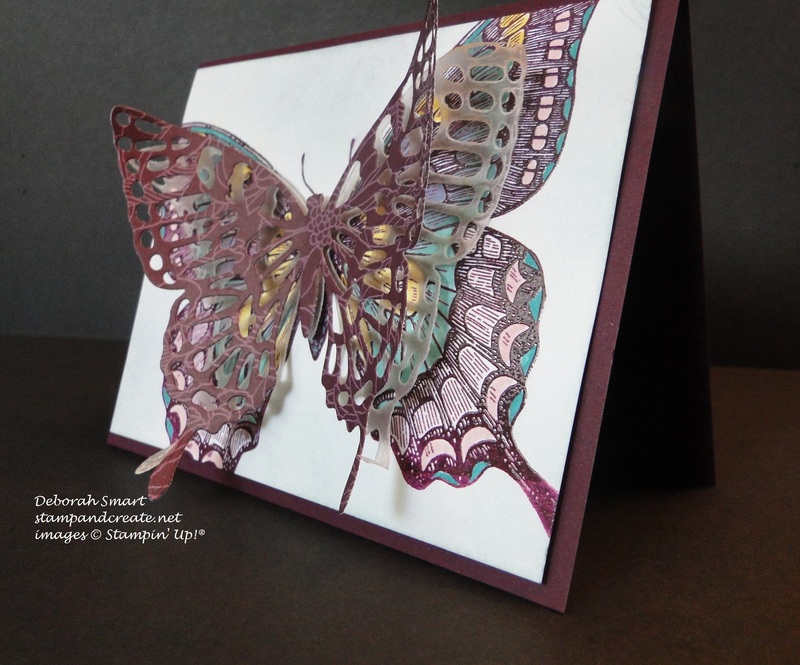 Love how you have used Butterfly Basics with the die set.